This simple panzanella recipe with roasted red peppers from Rachel Phipps can be whipped up in just 30 minutes. With a vibrant combination of roasted red peppers, basil and cucumber, this salad makes the perfect healthy midweek meal. If you’re going to go the the effort of baking your own bread, it seems a shame to throw away any stale chunks that might be left over after a couple of days. You could make breadcrumbs to coat a couple of chicken or veal escallops, or to pad out a batch of meatballs. 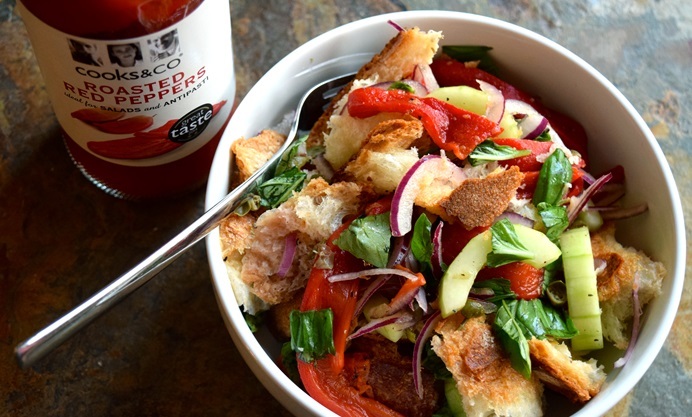 Or, you could make a classic Italian panzanella salad. 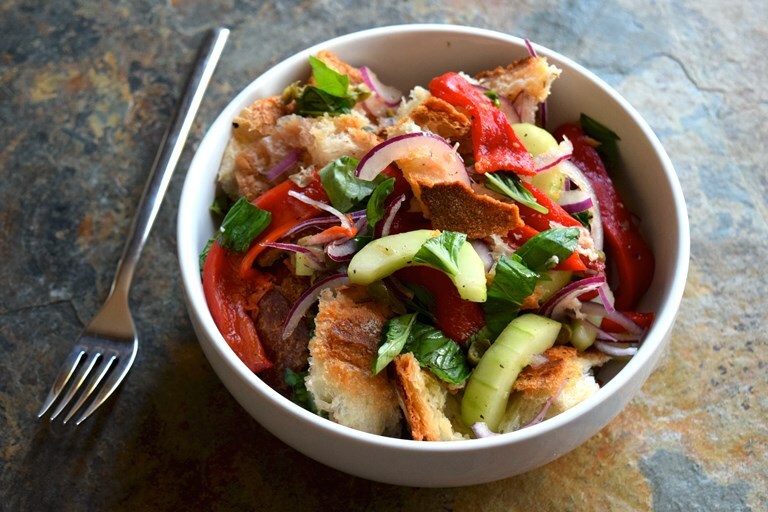 The panzanella most of us know is made up of familiar components; stale crusty bread, ripe summer tomatoes, fresh basil, extra virgin olive oil and a splash of red wine vinegar. Panzanella first appears in the 16th century in the writings of Florentine poet Bronzino. Bronzino describes a salad of bread, cucumber, basil, rocket, onions and vinegar, as tomatoes had yet to appear in the everyday Italian kitchen. So, it is not too much of a stretch from tradition to switch out familiar tomatoes (especially in the Spring just before they reach their prime) with tart slivers of roasted red pepper (from a jar, this is supposed to be a last minute supper, after all). Use what you enjoy and have to hand. I keep to tradition with slivers of red onion (soaked in cold water to remove their bite) and fresh basil. I up the umami factor with the addition of small, plump nonpareil capers.